The obit mentions a "family burial ground"so there may be other persons of interest there... are the burial records available on line? I had the old photo for years, it is cracked and faiding, I never looked at it with a magnifying glass to try and read what was written on the back. Should have done it years ago, it would have saved me hours of frustration. It was the Belfast Telegraph. Death notices are a bit of a lottery, for a start, the further back you go, the fewer there are. They really seemed to take off in numbers from around WW1 onwards, but even at that it varies case by case, sometimes you get lots of individual notices for a person, setting out the names and addresses of relatives, other times you simply get a single notice saying something like 'deeply regretted by the family circle', which isn't so helpful from the genealogical perspective. 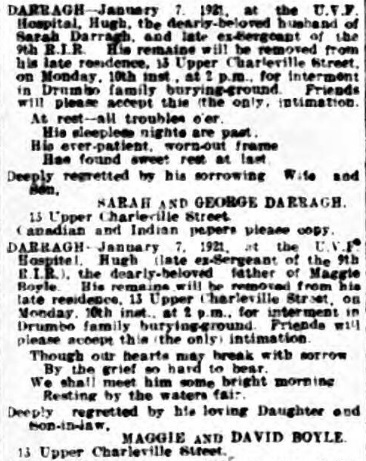 I did check for burial records online, including a collection of graveyard inscriptions on a website I subscribe to, but I couldn't find anything for Darraghs in Drumbo. Just tried the Belfast Telegraph site, could not get to the historic records.... where do I find them. Digitised editions of the Belfast Telegraph from 1871 to 1983 are available on the subscription website 'British Newspaper Archive', along with other local newspapers like the Belfast Newsletter (1828-1956) and the Northern Whig (1832-1957).